Aberdeen driver Chris Collie will return to the KNC Groundworks Ltd Motorsport UK Scottish Rally Championship (SRC) in 2019 behind the wheel of Brian Watson’s Mitsubishi Evo VIII. 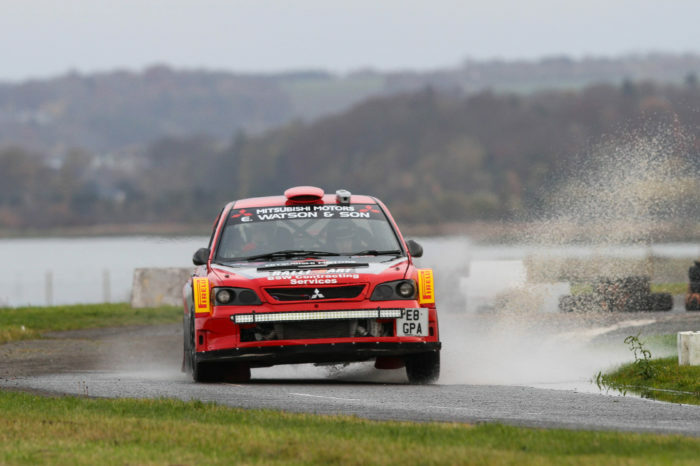 Collie’s last full season in the SRC was back in 2013 where he competed in a Mitsubishi Evo VI, taking a fine second place on the Granite City Rally – now Grampian Stages – on his way to eighth in the championship. Since then he has made sporadic appearances in that same Evo, a Peugeot 205 and a Subaru Impreza so is excited to get his teeth into a full campaign. He will be co-driven by Aberdeen’s Gary McDonald in 2019. “We’ve got a car sorted and I’ve got a few sponsors onboard that are enabling me to do this, so it’ll be good fun,” Collie said. Despite the upgraded machinery, Collie is under no illusion that it will be easy to start winning on his return to the Scottish forests. “In terms of a person I’m competitive by nature but I’m also realistic, I’ve been out for that long,” he continued. “Looking at the entry list that’s starting to pile up for the Snowman you’ve got [David] Bogie and [Euan] Thorburn back out, Jock [Armstrong] is there, Bruce McCombie is in a Focus WRC this year, then there’s Lawrence Whyte, John Wink, Donnie [Macdonald] in the R5s and the likes of Michael Binnie, Scott Macbeth, Simon Hay and SRC veteran Barry Groundwater in other Mitsubishi’s so it’s a big ask. The Coogie Urquhart Snowman Rally, round one of the 2019 SRC, has a fearsome reputation for its unpredictable nature. Collie says he is looking forward to that challenge. “The Snowman can be a lottery with the weather, you just don’t know what you’re going to get, it’s like our very own Monte-Carlo!” he joked. Collie’s presence in the SRC service park is set to benefit his fellow competitors, as through his sponsor Gibb Tools, all registered SRC drivers will receive a 10% discount on all Teng Tools products such as jacks, guns, sockets and ancillaries that are available in the van which is accompany the team on all seven events. Collie and Rob Wood from Gibb Tools Teng Van are also working on an end-of-season award that will be announced in due course. Entries remain open until Saturday for the Coogie Urquhart Snowman Rally, and can be made here.